Carmel, IN – Theta Chi Fraternity is proud to announce that Dan Markwell (Eta Gamma/Morehead State 1992) is the recipient of the 2017/2018 Sidney Ann Gilpin Lewis Memorial Trophy. 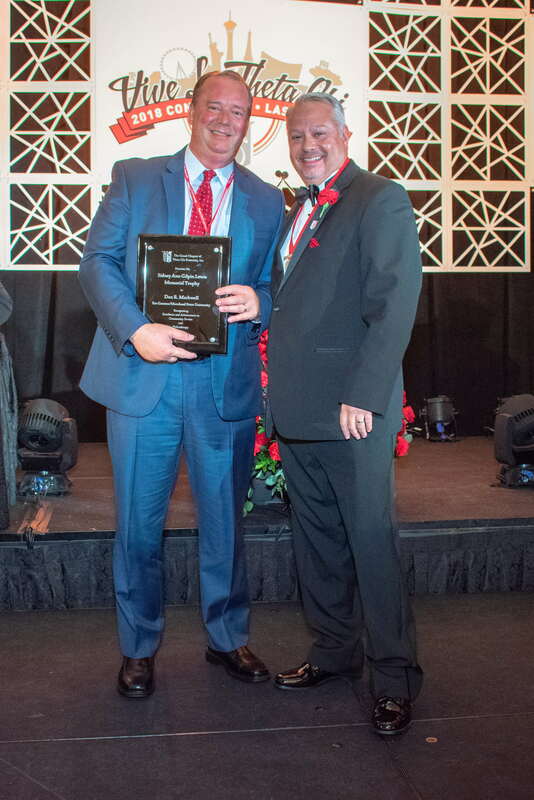 The Fraternity presented the award to Brother Markwell during the awards and recognition banquet at the 162nd Anniversary Convention in Las Vegas. In May 2017, Dan Markwell opened a Fazoli’s Restaurant in Maysville, KY and initiated several programs for free meals for children. Some of his offerings included free weekend meals, free snow day meals, and other programs called “No Kid Hungry,” “Share the Love,” and “Kids plus Summer equals Hunger.” All a person in need had to do was ask. No questions were asked in return. Brother Markwell is also a strong supporter of local organizations and groups and contributed to fundraisers for local schools and animal shelters. He hosted numerous free-meal days for local pastors, emergency workers and first responders, educators, sanitation workers, utility workers, and many, many more. One of his most remarkable acts that demonstrated Theta Chi Fraternity’s Helping Hand occurred during July 2017, when severe flooding crippled many parts of Maysville-Mason County in Kentucky. Dan responded to the needs of those affected by the devastating flood and provided free meals to citizens who were displaced, as well as to any workers who were cleaning up the devastation. Last year, Brother Markwell donated more than $100,000 in meals – an astonishing amount of generosity and a true representation of the Helping Hand. Brother Markwell also serves on numerous boards and committees, including the Saint Claire Regional Medical Center, Downtown Morehead, Inc., NewCities, and The Morehead Chamber of Commerce. He works tirelessly on projects that will benefit the local community and was instrumental in bringing additional festivals to his community by assisting with long-term planning and city and county ordinance changes. He truly united different agencies to work toward one goal. In addition, Dan has been instrumental in the resurgence of his local chapter and works closely with collegiate brothers as a member of its chapter advisory board. He is also a member of the chapter’s house corporation, where he made financial contributions to renovate and improve the chapter house. He continues to push for greater and more active alumni engagement. Brother Dan Markwell represents the true spirit of An Assisting Hand. In desperate times of need, he provided support to thousands who sought his help. The Lewis Award, represented by the Lewis Memorial Trophy, is based on the account of past National Vice President James G. Lewis (left). In 1930, his daughter, Sidney Ann, was stricken with spinal meningitis, which developed from an infection following a serious operation. Lewis gave blood transfusions but when doctors refused to use his blood again, it was essential that others be found whose blood would match Sidney Ann’s. Fellow Grand Chapter officer Dr. Robert L. Irish, of Alpha Chapter at Norwich University, was in constant contact with the situation and informed the officers of Upsilon Chapter at New York University. The next day several of Upsilon’s members arrived at the hospital offering to donate their blood. Two more transfusions were made, but tragically, Sidney Ann passed away at midnight. 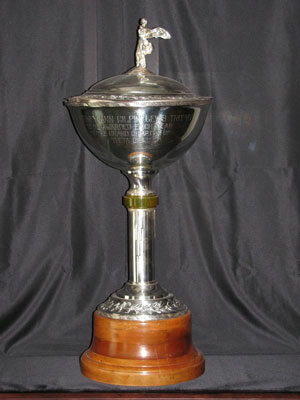 Later that year, Brother Lewis presented a trophy to the Grand Chapter in memory of his daughter. He did not specify a purpose, but merely wanted to thank the Fraternity for its assistance during the period of his daughter’s illness. Today, the Lewis Award recognizes Theta Chi members and chapters that most exemplify lending a helping hand to their campus and community, matching the true Theta Chi spirit demonstrated by Dr. Irish and Upsilon Chapter’s desire to help Brother Lewis in his time of need. Founded in 1856, Theta Chi Fraternity is a men’s collegiate fraternity with more than 191,000 initiated members and has established 239 chapters. Leadership development, personal development, and service to alma mater are fundamental to Theta Chi Fraternity’s mission.